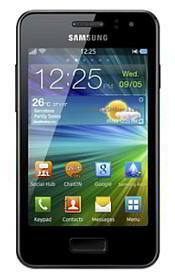 The Samsung Wave M S7250 was recently officially launched in India, priced at roughly Rs. 12,500. The Bada 2.0-based Wave M is also retailing for Rs. 11,900 for now, at Letsbuy.com. The Wave M S7250 has a 3.65-inch HVGA (320x480) display, 832MHz processor, 5MP autofocus camera with LED flash, front-facing VGA camera, 150MB built in storage, expandable via microSD (2GB card bundled), and a 1,500 mAh battery that is rated to deliver up to 6 hour 30 minutes of talktime, and 480 hours of standby time. The Samsung Wave M also has such connectivity options as HSDPA 7.2Mbps, Wi-Fi 802.11 b/g/n, GPS with A-GPS support, stereo FM with RDS, Bluetooth 3.0 with A2DP, and microUSB 2.0. Bundled onboard, is the TouchWiz UI, Samsung ChatON instant messaging platform, push email, and an image editor. The Wave M weighs in at 121 grams, and has a 12.2mm thickness. Notably, the Wave M S7250 also features DNSe (Digital Natural Sound Engine) audio.